ACLU files federal lawsuit against Vermont police officer for writing a bogus traffic ticket and lying about it in court. A man slapped with a bogus traffic ticket in Shelburne, Vermont is fighting back against the police officer who issued it. With the help of the American Civil Liberties Union of Vermont, Rod MacIver filed a suit in the US District Court for the District of Vermont on Thursday over the December 9, 2012 traffic stop. 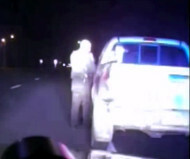 Officer Jason P. Lawton pulled over MacIver’s truck and accused him of running a red light, even though a dashcam video of the incident confirms that did not happen (view video). When MacIver began arguing with Officer Lawton, he was slapped with a $214 ticket and two points against his driver’s license. Lawton then filed a complaint about the rookie officer with the Shelburne Police Department, and Sergeant Allen Fortin emailed Lawton back claiming that he had reviewed the video and it showed a violation. Weeks later, after being a charged a $45 fee, Lawton obtained the video which clearly showed he legally entered the intersection of Allen Road and Route 7 while the light was yellow. Officer Lawton testified in court that Lawton broke the law. At the March 6 hearing on the case, MacIver showed the video and the judge was angry that the officer had seen the video before entering the courtroom but continued to say MacIver ran a red light. “Please explain to me why you testified under oath that the light had turned red before he entered the intersection?” Superior Court Judge Howard A. Kalfus asked Officer Lawton. Officer Lawton said he testified to what he thought happened, which was different from what actually happened. MacIver was found not guilty, but he was not willing to let the police department get away with this bad conduct. The lawsuit alleges Officer Lawton illegally seized MacIver in violation of his Fourth Amendment rights and then violated his First Amendment rights by ticketing him for arguing over the bogus stop. He seeks a jury trial on the matter. Jeff Hennie, the Vice President in Charge of Governmental Relations and Public Affairs for the Motorcycle Riders Foundation, published an alert concerning a bill being introduced by Congressman Jim Sensenbrenner that would prohibit the use of federal funding for motorcycle only checkpoints. Motorcyclist’s rights organizations and many independent motorcyclists oppose motorcycle only checkpoints as a discriminatory practice that unfairly singles out motorcycles as posing some special danger. This is despite the fact that the latest census numbers show that motorcycles make up only 4.7 % of all crashes in which there is injury or death. We have no objection with safety checkpoints as a whole. The objection we have is stopping only motorcycles. There is simply no justification for this practice. For one, motorcycle only checkpoints tend not to be fruitful. An example is the large checkpoint that was set up during Rolling Thunder a few years ago. Those conducting the checkpoint stopped 579 motorcycles over a period of seven hours and managed to write only 11 tickets. This and the discriminatory aspect of these checkpoints is what has led some states such as North Carolina and Virginia to prohibit these checkpoints within their borders. That being said, motorcyclists travel across state lines so this legislation is important to all motorcyclists regardless of what their particular state does. Our position is that we support safety checkpoints for all vehicles. If I am on my bike and there is a safety checkpoint stopping all motorists than I will gladly cooperate and subject myself to the brief detention connected with such a stop. What I object to is being singled out from the motoring population as a whole due to the fact that I operate a motorcycle. You may read Jeff Hennie’s alert below. If you believe that motorcycle only checkpoints are a discriminatory practice which should not be conducted with federal funds than please contact your congressional representative and urge him or her to become an original cosponsor of this legislation. As always, if you have any questions or comments about anything that I have written please feel free to contact me. The Motorcycle Riders Foundation (MRF) reports, Congressman Jim Sensenbrenner from Wisconsin, announced Monday, April 15th that he will file a bill to prohibit the federal funding of motorcycle only roadside checkpoints. The bill will officially be introduced on May 6, 2013 and get its official bill number then. However, we must start the push now. It’s important to contact your sitting member of the House of Representatives and ask them to be an original cosponsor of this important legislation. Ask them to contact Congressman James Sensenbrenner and lend their support. An “Original Cosponsor” is someone who supports the bill before it is made public and is a way to strongly support a new bill. The American Motorcyclist Association began tracking motorcycle-only checkpoints when they first appeared in New York in 2007. In 2011, using funds provided by the National Highway Traffic Safety Administration, the state of Georgia conducted roadside motorcycle-only checkpoints as thousands of motorcyclists rode through the state on their way to Daytona Beach, Fla., for Bike Week, March 4-13. Another motorcycle-only checkpoint was conducted in northern Virginia during one of the nation’s most visible motorcycle rallies — Rolling Thunder — over the 2011 Memorial Day weekend. Motorcycle-only checkpoints were also conducted in Utah when thousands of riders attended a world-class roadracing event. Five states have since outlawed the practice — Virginia, North Carolina, New Hampshire, Illinois, California — and legislation to prohibit them has been introduced in Missouri and New Jersey. See below for information on what AMA members have done so far on this issue. April 17, 2013-The AMA issued an alert to urge support for U.S. Rep. Jim Sensenbrenner’s Stop Motorcycle Checkpoint Funding Act. July 16, 2012-The AMA sent California Gov. Jerry Brown a thank you letter for signing Assembly Bill 1047 into law. July 16, 2012-California Gov. Jerry Brown signed Assembly Bill 1047 into law. The bill prohibits motorcycle-only checkpoints. July 6, 2012-Illinois Gov. Pat Quinn signs House Bill 930 into law, banning any Illinois law enforcement agency from accepting federal funds for motorcycle-only checkpoints. July 2012-American Motorcyclist magazine reports in StateWatch column on California Assembly Bill 1047 and Missouri Senate Bill 897 (page 17). July 2012-AMA News & Notes article reports on Illinois House Bill 930, passed by both House and Senate, and sent to Illinois Gov. Pat Quinn for consideration. June 12, 2012-AMA testifies in support of California Assembly Bill 1047 at Senate Transportation Committee hearing in Sacramento. June 11, 2012-The AMA sent thank you letters to every U.S. representative who signed onto the Sensenbrenner/Petri letter addressed to the leadership of the House-Senate Surface Transportation Reauthorization Conference Committee in support of including H.R. 904 in the conference report. June 11, 2012-The AMA sent a thank you letter addressed to U.S. Reps. Jim Sensenbrenner (R-Wis.) and Tom Petri (R-Wis.) for taking the lead on a letter addressed to the leadership of the House-Senate Surface Transportation Reauthorization Conference Committee in support of including H.R. 904 in the conference report. June 2012-American Motorcyclist magazine reports in StateWatch column on Illinois House Bill 930 and Missouri Senate Bill 897 (page 19). June 2012-AMA News & Notes article reports on Missouri Senate Bill 897, passed by the Senate Judiciary and Civil and Criminal Jurisprudence Committee on April 30. May 29, 2012-The AMA sent a communication to every U.S. representative in support of U.S. Reps. Jim Sensenbrenner (R-Wis.) and Tom Petri’s (R-Wis.) congressional letter addressed to the House-Senate Highway Conference Committee urging them to include H.R. 904 in the conference report. May 29, 2012-AMA Action Alert: Lawmaker urges committee leadership to include language to prohibit funds for motorcycle-only checkpoints in transportation bill. May 2012-American Motorcyclist magazine reports on passage of Virginia House Bill 187 (page 18). May 2012-AMA News & Notes article reports on California Assembly Bill 1047. April 30, 2010-AMA California Action Alert: Help stop motorcycle-only checkpoints in California! April 26, 2012-AMA Action Alert: Support language to prohibit the funding of discriminatory motorcycle-only checkpoints in final transportation bill. April 26, 2012-The AMA sent a letter addressed to the House conference committee conferees dealing with transportation issues urging them to include the motorcycle-only prohibition language in the highway conference report. April 25, 2012-The AMA sent a letter addressed to the Senate conference committee conferees dealing with transportation issues urging them to include the motorcycle-only prohibition language in the highway conference report. April 25, 2012-AMA letter of support for California Assembly Bill 1047 sent to Senate Transportation and Housing committees. April 24, 2012-AMA Missouri Action Alert: Motorcycle-only checkpoint legislation scheduled for April 25 hearing. April 2012-AMA News & Notes article reports on Missouri Senate Bill 897, passed by the Senate Judiciary and Civil and Criminal Jurisprudence Committee on April 30. March 9, 2012-AMA Action Alert: Georgia may utilize federal grant for motorcycle-only checkpoints during Daytona Bike Week again. March 7, 2012-AMA New Jersey Alert: Bills introduced to end motorcycle-only checkpoints. March 7, 2012-The ABATE of the Garden State and the AMA sent a joint letter of support addressed to the state Sen. Jeff Van Drew for sponsoring Senate Bill 1685. The bill would prohibit motorcycle-only checkpoints in New Jersey. March 7, 2012-The ABATE of the Garden State and the AMA sent a joint letter of support addressed to the state Reps. Nelson Albano andMatthew Milam for sponsoring Assembly Bill 508. The bill would prohibit motorcycle-only checkpoints in New Jersey. March 2, 2012-AMA Virginia Action Alert: Governor signs bill to end motorcycle-only checkpoints. March 2, 2012-The AMA sends a thank you letter addressed to Virginia Gov. Bob McDonnell for signing House Bill 187 into law. The law prohibits motorcycle-only checkpoints in the commonwealth. Feb. 28, 2012-Virginia Gov. Bob McDonnell signed House Bill 187 into law, which prohibits motorcycle-only checkpoints. The law takes effect July 1. Feb. 13, 2012-AMA Virginia Action Alert: Bill to end motorcycle-only checkpoints heads to governor for signature. Feb. 8, 2012-AMA Virginia Action Alert: Senate committee passes bill to end motorcycle-only checkpoints. Feb. 1, 2012-AMA Virginia Action Alert: State Senate considers bill to end motorcycle-only checkpoints. Feb. 2012- AMA News & Notes article reports on Assembly Bill 1047, legislation to prohibit any California law enforcement agency from using grant money received for a motorcycle safety program funds from being used for motorcycle-only checkpoints. Jan. 31, 2012-AMA Virginia Action Alert: Assembly passes bill to end motorcycle-only checkpoints. Jan. 30, 2012-AMA Virginia Action Alert: Assembly to vote on bill to end motorcycle-only checkpoints. Jan. 27, 2012-AMA Virginia Action Alert: Assembly to vote on bill to end motorcycle-only checkpoints. Jan. 16, 2012-The AMA sends a letter of support addressed to Virginia state Rep. Todd Gilbert for sponsoring House Bill 187. The bill would prohibit motorcycle-only checkpoints in Virginia. Jan. 16, 2012-AMA Virginia Action Alert: Bill introduced to end motorcycle-only checkpoints. Jan. 3, 2012-AMA letter of support for California Assembly Bill 1047 sent to Assemblyman Kevin Jeffries (bills author/sponsor). Sept. 2011-American Motorcyclist magazine reports in StateWatch column on North Carolina House Bill 381 (page 16). Aug. 2, 2011-Virginia Gov. Bob McDonnell responds to the AMA’s letter, dated May 31, 2011, regarding the motorcycle-only checkpoint implemented during the annual Rolling Thunder event. Aug. 2011-American Motorcyclist magazine reports in StateWatch column on New Hampshire House Bill 148 (page 17). Aug. 2011-AMA News & Notes article reports that North Carolina Gov. Beverly Perdue signed House Bill 381, legislation that prohibits law enforcement agencies from establishing patterns of vehicle stops at checking stations based on a particular type of vehicle, into law on June 23. Aug. 2011-AMA News & Notes article reports on Virginia House Bill 187, legislation that would prohibit motorcycle-only checkpoints. July 2011-AMA News & Notes article reports that New Hampshire Gov. John Lynch signed House Bill 148, legislation that would prohibit any New Hampshire law enforcement agency from accepting federal funding to establish motorcycle-only checkpoints, into law on May 20. The law took effect July 15, 2011. June 22, 2011-Arlington county police chief responds to AMA member regarding motorcycle-only checkpoint during the annual Rolling Thunder event. June 13, 2011-AMA Action Alert: Support federal legislation to prohibit the funding of discriminatory motorcycle-only checkpoints. June 2011-American Motorcyclist magazine reports in StateWatch column on North Carolina House Bill 381 (page 18). May 31, 2011-AMA Virginia Action Alert: County implements motorcycle-only checkpoint during Rolling Thunder. May 31, 2011-The AMA sent a letter addressed to Virginia Gov. Bob McDonnell regarding the implementation of a motorcycle-only checkpoint during the annual Rolling Thunder event. May 28, 2011-The Arlington County Police Department of the Commonwealth of Virginia implemented a motorcycle-only checkpoint during the annual Rolling Thunder. May 25, 2011-Lawmakers sent letter addressed to the leadership of the U.S. House Transportation and Infrastructure Committee in support of including H.R. 904 in the Surface Transportation Reauthorization bill. May 2011-American Motorcyclist magazine publishes article, “Lawmakers Target Motorcycle-Only Traffic Checkpoints” in the Rights section (page 16). May 2011-American Motorcyclist magazine reports in StateWatch column on New Hampshire House Bill 148 (page 17). May 2011-AMA News & Notes article reports on North Carolina House Bill 381, legislation that prohibits law enforcement agencies from establishing patterns of vehicle stops at checking stations based on a particular type of vehicle. April 2011-AMA News & Notes article reports on New Hampshire House Bill 148. March 9, 2011-The Georgia State Patrol implemented a motorcycle-only checkpoint during Daytona Bike Week. March 3, 2011-AMA Action Alert: Federal bill introduced to prohibit funding discriminatory motorcycle-only checkpoints. March 3, 2011-The AMA sent a letter addressed to U.S. Rep. Jim Sensenbrenner (R-Wis.) thanking him for introducing H.R. 904. The bill would prohibit federal funds for the implementation of motorcycle-only checkpoints. March 2011-AMA News & Notes article reports on New Hampshire House Bill 148, legislation that would prohibit any New Hampshire law enforcement agency from accepting federal funding to establish motorcycle-only checkpoints. Feb. 28, 2011-The AMA sent a letter addressed to the Daytona Regional Chamber of Commerce to inform them of the possible motorcycle-only checkpoint in the state of Georgia and the effect on local businesses. Feb. 22, 2011-AMA Georgia Action Alert: State of Georgia may utilize federal grant for motorcycle-only checkpoints during Daytona Bike Week. Feb. 15, 2011-The AMA sent a letter to Gov. Nathan Deal of Georgia requesting he suspend the implementation of the federal grant until questions raised by the motorcycling community are addressed. Nov. 17, 2010-AMA Action Alert: Administrator Strickland responds to AMA’s letter regarding grant program to fund motorcycle-only checkpoints. Nov. 15, 2010-NHTSA Administrator Strickland responds to the AMA’s letter, dated Aug. 9, 2010, on the use of motorcycle-only checkpoints. Oct. 26, 2010-The AMA sent a letter addressed to the Georgia Gov. Sonny Perdue requesting he suspend the implementation of the federal grant until questions raised by the motorcycling community are addressed. Oct. 21, 2010-AMA Georgia Action Alert: The state of Georgia is the only recipient to receive grant to conduct motorcycle-only checkpoints. Oct. 19, 2010-AMA Action Alert: Update: Congressional letter aims to suspend NHTSA program to fund discriminatory motorcycle-only checkpoints. Sept. 30, 2010-AMA Action Alert: Congress members urge U.S. transportation secretary to suspend funding for motorcycle-only law enforcement checkpoints. Sept. 27, 2010-AMA Action Alert: Sept.29 deadline for representatives to sign congressional letter to suspend motorcycle-only checkpoints. Aug. 13, 2010-AMA Action Alert: AMA seeks suspension of grant program that targets motorcyclists with checkpoints. Aug. 9, 2010-The AMA sent a letter addressed to NHTSA Administrator David Strickland urging him to suspend a grant program until questions about the use of motorcycle-only checkpoints have been addressed. July 13, 2010-The NHTSA posts a grant notice for states seeking federal funds to implement motorcycle-only checkpoints. June 9, 2010-The Utah Highway Patrol responds to the AMA’s communication regarding our concerns with the May 30, 2010, motorcycle-only checkpoint. June 8, 2010-The AMA communicates with the Utah Highway Patrol regarding a motorcycle-only checkpoint near the Miller Motorsports Park on May 30, 2010. Police say that more than 150 motorcyclists breezed through a roadside check that police tried to set up on Vancouver Island. Police Profiling Patches: These type of traffic check points are unconstitutional as they are profiling bikers and violate the right of people on motorcycles. More than 150 motorcyclists — including members of Hells Angels — flouted police authority Saturday when the group refused to stop at a roadside check on Vancouver Island. According to Sgt. Lindsey Houghton, police had information that the bikers would participate in a group ride Saturday and set out to conduct safety checks. Police officers from the Combined Forces Special Enforcement Unit of B.C. and other integrated road safety units then gathered near Duncan to monitor and halt the large group of motorcyclists, who had plans to travel from Nanaimo to Victoria on the Island Highway. “The bikers, many of whom were observed allegedly ignoring red lights at intersections, speeding, and unsafely passing other vehicles on the road after leaving Nanaimo, were stopped on Highway 1 southbound near the North Cowichan Municipal Hall shortly after 2 p.m.,” Houghton said. However, the bikers refused to pull into the roadside check area that had been set up and instead, blocked the highway, refusing direction from officers. The showdown ended when outnumbered officers were faced with no choice but to let the group pass. Houghton said police “documented the refusals” and would follow up with appropriate enforcement. We have added a new link on our Resources page: National Speed trap Exchange make sure you go check it out.